To purchase a student ticket (£7) please enter the code 3_CONC at checkout. Horses! Horses! is a new pub play by Rina Vergano. “The Pub is the Hub, ladies and gents, so it’s use it or lose it time”. HORSES! HORSES! is the darkly comical tale of a stolen horse, wild west-country soul and the mess we make of relationships. Landlord Johnny is desperately trying to save his pub, while his wife Susie is hiding out on Ted’s farm. 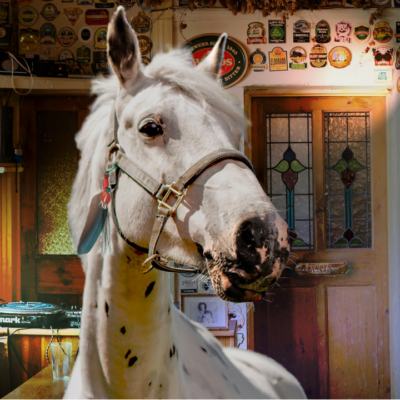 A show performed in the midst of your local boozer with pub games, pints, crisps, heartbreak and laughter, county music, lots of karaoke and a few surprises. A co-production between Wassail Theatre Company and Theatre Orchard, in association with Bristol Old Vic’s Literary department.